The Government of Maharashtra has established "ADMISSIONS REGULATING AUTHORITY AND STATE COMMON ENTRANCE TEST CELL" as per the provisions of Maharashtra Unaided Private Professional Educational Institutes (Regulation of Admission & Fees) Act.2015, (hereinafter the act). 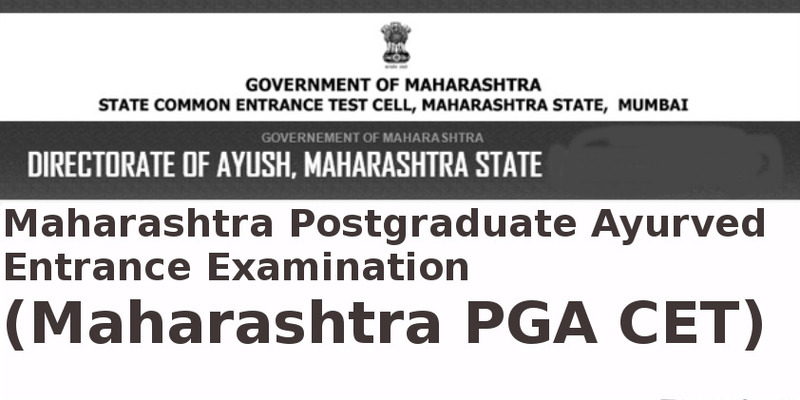 The Commissioner of State CET Cell has been designated as Competent Authority for conducting Maharashtra PGA-CET and selection of candidates for admission to all courses for the year. Candidates can get the full details of Maharashtra PGA CET Exam 2017 such as Application Form, Exam Pattern, Syllabus, Important Dates and much more on this post. - The candidate must be an Indian National. Nationality Certificate issued by District Magistrate or Additional District Magistrate or Chief Metropolitan Magistrate or valid passport or School Leaving certificate (SSC) /Jr. College Leaving Certificate of HSC/12th Std. indicating the nationality of the candidate as “Indian” shall constitute the proof of nationality. - The candidate possessing any of the qualification mentioned in the second schedule appended to the Central Council of Indian Medicine Act, 48 of 1970 and are covered under Parts “A”,”A-1”,”B”,”C” Schedule appended to Maharashtra Medical Practitioners Act, 1961 and passed the qualifying examination from the state of Maharashtra (except for Out of State Category) and have completed one year rotatory internship before the commencement of first round of Preference filling are only eligible. - Candidate should have obtained minimum 50% or more marks in PGACET and 40% in case of constitutional reservation. A person with disabilities with General Category must secure not less than 45% marks in PGA-CET examinations. - The candidates must produce the Registration of M.C.I.M at the time of Preference filling. Candidates from out of the state of Maharashtra should produce either Registration or proof of application for Registration with MCIM. - A candidate will not be eligible to appear for PGA-CET 2016 for 3 years from the date of cancellation of PG admission if he/she has cancelled his/her earlier registration any time after the cutoff or at any stage during the PG course. Out of State Candidates should apply for "Online PGA-CET " examination by filling online application form. - Candidate must be an Indian National. Document required establishing this shall be Nationality Certificate issued by appropriate authority or Candidates valid passport. - A candidate should have passed final B.A.M.S. degree from a recognised Ayurved college included in the schedule to the Central Council of Indian Medicine Act, 1970. - M.C.I.M. registration is a pre-condition for admission to Postgraduate Ayurved courses. The candidate must produce the proof of application to Maharashtra Council of Indian Medicine (MCIM) at the time of preference filling. However, if the candidate fails to produce the Registration Certificate within the period of one year, his/her selection shall be cancelled. - Candidate should have obtained minimum 50% or more marks in PGA-CET. The Competent Authority shall issue Notification regarding online application form process. The information Brochure containing procedures for Online Common Entrance Test for admission to MD(Ayu)/MS(Ayu) & P.G Diploma post graduate ayurvedic courses will be made available on website of www.mahayush.gov.in & www.mahacet.org An applicant seeking admission to the PGA-CET will be required to submit single prescribed online application form (ANNEXURE "C" Specimen Copy of online application form). have to be borne by the applicant. This amount is not refundable. - Applicants to visit Directorate of AYUSH website www.mahayush.gov.in & www.mahacet.org. Open the link for filling the Online Application Form, click on the option "APPLY ONLINE" which will open a new screen. - Applicants are advised to carefully fill and verify the details filled in the online application themselves as no change will be possible/ entertained after clicking the FINAL SUBMIT BUTTON. - The Name of the applicant or his/her Father/Husband etc. should be spelt correctly in the application as it appears in the Certificates/ Mark sheets. Any change/ alteration found may disqualify the candidature. - Validate your details and Save your application by clicking the 'Validate your details' and 'Save & Next' button. - Applicants can proceed to upload Photo & Signature as per the specifications are given in the Guidelines for Scanning and Upload of Photograph and Signature. - Applicants can proceed to fill other details of the Application Form. - Click on the Preview Tab to preview and verify the entire application form before FINAL SUBMIT. - Modify details, if required, and click on 'FINAL SUBMIT ONLY' after verifying and ensuring that the photograph, signature uploaded and other details filled by you are correct. - Click on 'Payment' Tab and proceed for payment. (xii) Click on 'Submit' button. - Once opted and form the finally submitted subject of broad specialities cannot be changed. The PGA-CET will consist of one common question paper of three hours duration containing 250 Multiple Choice Questions (MCQ) based on the respective year syllabus of BAMS Course of CCIM and shall cover all the subjects of BAMS Course mentioned below. All questions will be single response objective type. The medium for examination shall be, Marathi,Hindi & English.The indicative number of questions of each subject will as given below. - Duration of paper will be of 3 hours. The medium of examination will be Marathi, Hindi & English. - The candidate has to go to the Examination Centre with downloaded Admit Card and any Photo ID proof (Aadhar Card/ Driving license/ PAN Card/ Passport/ valid MCIM ID). Without photo ID Proof Entry in Examination centre is not allowed. - The issue of Admit Card is merely an enabling document for appearing at the PGA-CET and does not imply that the candidate satisfies all the requirements of eligibility conditions of admission.